"At just five years old, Maureen Hancock discovered her ability to communicate with the dead. Descended from a long line of legendary Irish mystics, she was no stranger to the spiritual realm, but for fear of being misunderstood by her friends and family, she kept the otherworldly messages to herself, eventually suppressing them completely. Maureen Hancock literally is the Medium Next Door. And in this book and through her stories of her encounters with the otherworld, as well as guided exercises at the conclusion of each chapter, she offers the same comfort and wisdom she shares in her healing encounters and lectures about what is out there waiting for all who are open to its mysteries..."
"Maureen Hancock is a nationally renowned spirit medium, teacher, lecturer, and holistic healer. An associate member of the Licensed Private Detective Association of Massachusetts, Maureen is cofounder of the nonprofit organizations Seeds of Hope and Mission for the Missing. She lives in a small town south of Boston with her husband, two children, and chocolate lab, Ally. Visit the author at www.maureenhancock.com." 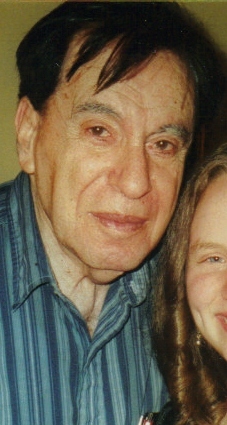 My father (pictured above) passed away in 2005, and I highly doubt he believed in spirits let alone someone "speaking" with the dead, so I tend to be a bit skeptical when it comes to the paranormal. It intrigues me to no end, but it was just so difficult for me to believe...until last night. Maureen's book is an absolute fantastic account of many different readings she's done at events, finding missing people, etc. While reading the book, I was amazed at how accurate she seemed to be and how well she "proved" herself to the people she was reading for. I also love how she gives tips at the end of each chapter on life, death and spirits. Her stories of people she's read for hooked me right in, and I polished off the book in one day. So I decided to go to one of her "Postcards from Heaven" events near Boston to see for myself (and to get my book signed). 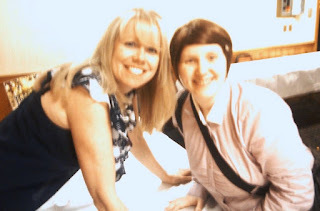 I sat towards the back so I could be the first to get my book signed at the end (which I was - you can see a picture of us below, although it's not a very good one), and just watched her go from table to table giving messages from spirit. Maureen is also a comedienne, so she was joking around and laughing the entire time. The things coming out of her mouth were hilarious!! Her readings throughout the night were just amazing. She was dead on accurate for everyone she spoke to...it was just uncanny! She was giving names, ages, causes of death, you name it. Then she was drawn to my table. She started reading for a gentleman sitting at my table, talking about his father. While she was talking to him, she said "I'm picking up on a 'D' name..." The gentleman shook his head no, so she went on, "Maybe Dan or Don..." I piped up, "My dad's name was Dan." "Oh good. I'll be with you shortly." Needless to say, my jaw dropped to the floor, and I was fighting back tears. When she got to me, she portrayed my father exactly to a T. For many people she had brought from spirit, she had said they were strong and chatty, but not my dad. She said my dad was being quiet and not saying very much, no real emotion showing, basically dead pan (if you pardon the pun). Yep...that's my dad! He was never a man of many words and almost never smiled in pictures (again, see above). She told me that my dad said I was still his little girl and that he thinks I'm a wonderful mom. She also said that there was a woman standing on my right (which signifies my mother's side of the family) who we believe was my grandma. In any case, it was just astounding to me that she picked up on my dad (the guy who didn't believe in spirits) and was 100% accurate when talking about him. Even if you are only somewhat interested in the paranormal or spiritual world, you must read Maureen's book. And if you live in the Boston area, you must make a trip to one of her "Postcards from Heaven" events. She is an amazing link between our world and the next. Cost: You can buy The Medium Next Door for $8.53 from Amazon.com. Overall: We give Maureen and her book a 10/10! 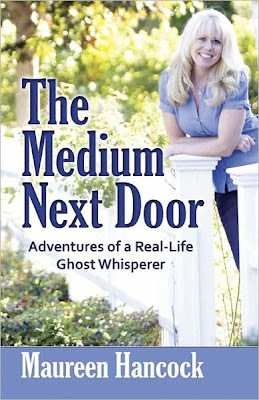 One very lucky reader will win a copy of The Medium Next Door! We were sent a copy of "The Medium Next Door" free of charge for the sole purpose of this review; no other compensation was received. All opinions expressed are my own. I always liked church lady. I would like to get a message from my grandmother. I would love a message from my brother.